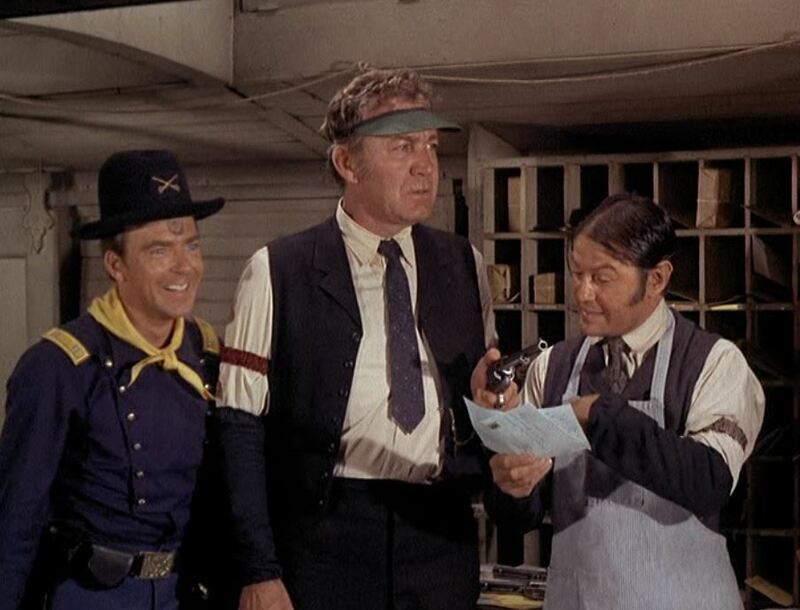 I can’t resist including a television episode of F-Troop on my movie blog. 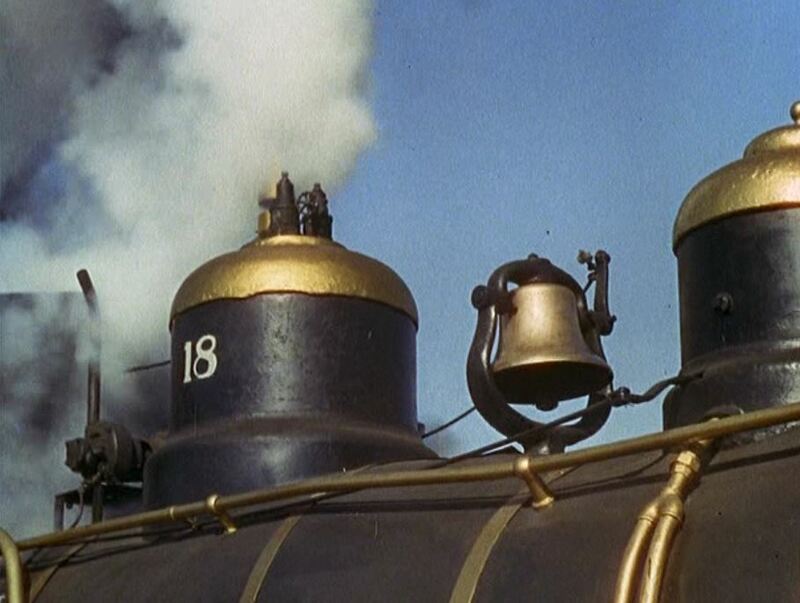 This color episode from season two is chock full of old movie clips of a wood-burning steam engine and train. 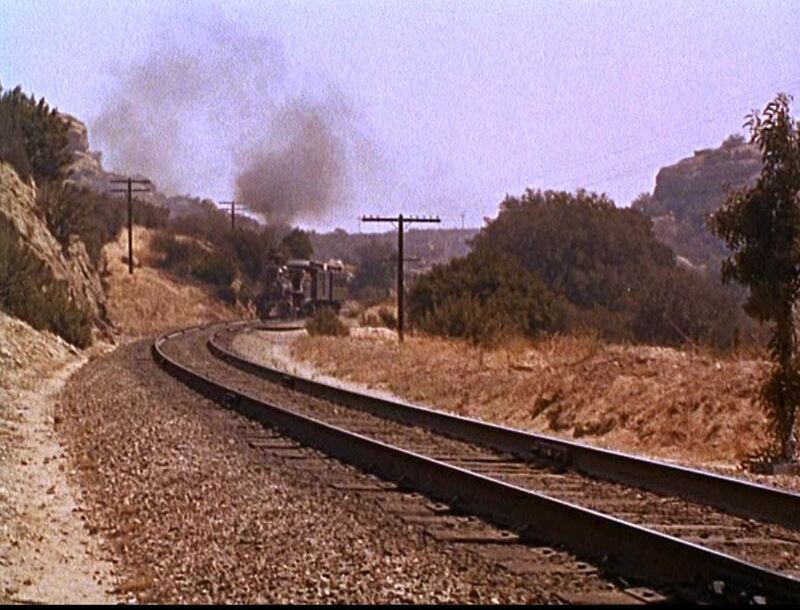 Opening scenes show a 4-4-0 steam locomotive #22, with tender lettered “V.& C.C. R.R.” (presumably Virginia and Carson City Railroad). 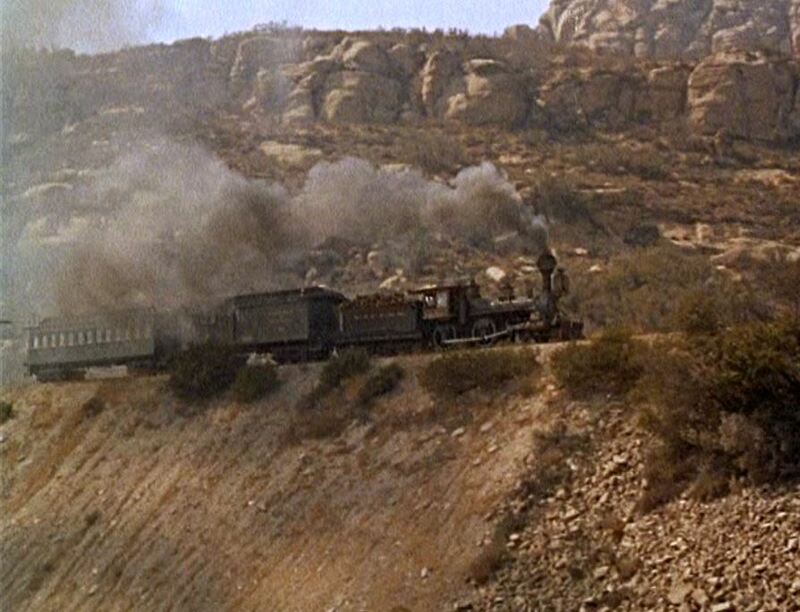 I believe this is the ex-Virginia & Truckee engine #22 “The Inyo”, purchased by Paramount Pictures…and then sold back to the State of Nevada. The ancient steamer was built in 1875 and has recently been restored to operation! 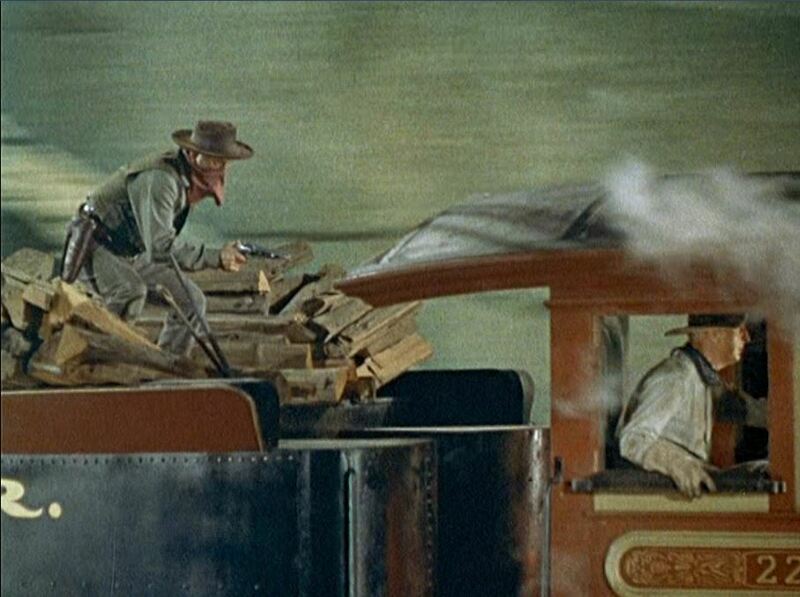 Come along as Corporal Agarn and Sergeant O’Rourke pose as mail clerks on a working RPO (Railway Post Office) car! V&CC RR #22 smokes along (rods down shot!) with a baggage car and passenger coach in tow. 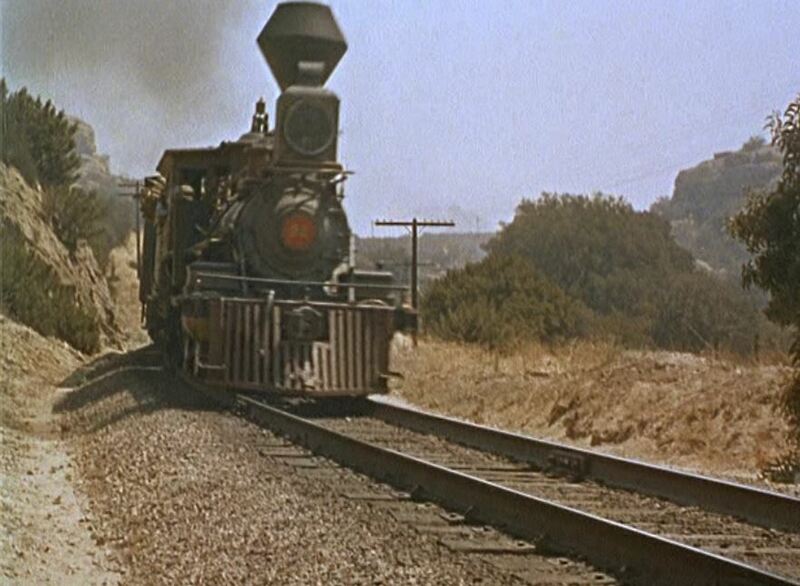 4-4-0 #22 and train open the episode with a quick roll by. 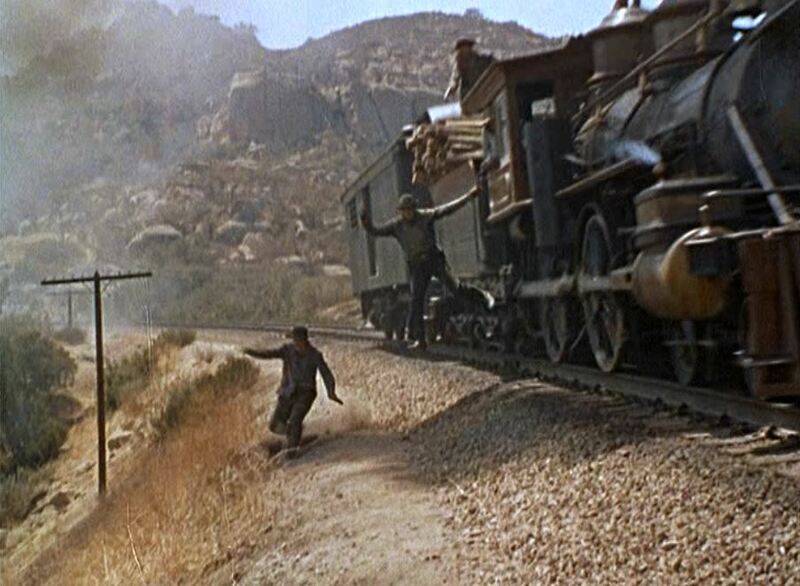 One of the bad guys gets the drop on the engine crew and their shotgun-toting deputy; At gunpoint, the deputy and fireman are forced to jump off the locomotive in a spectacular stunt. 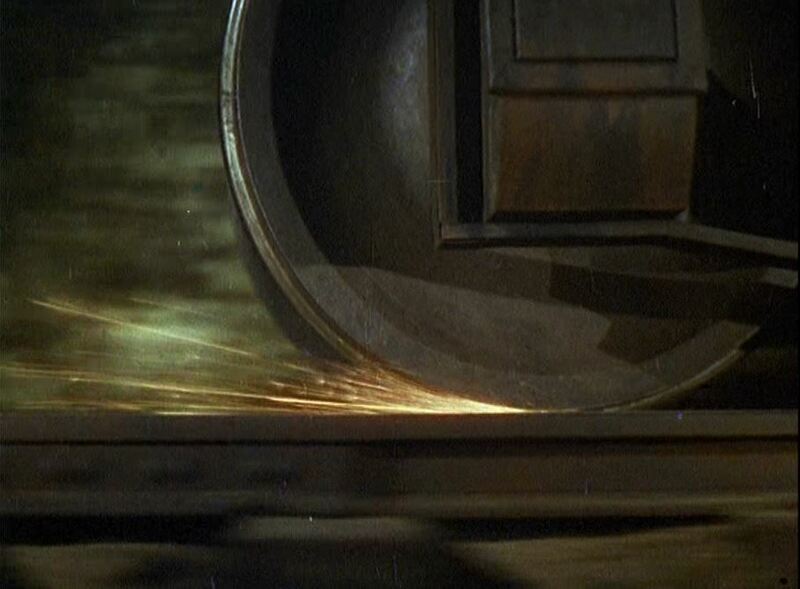 Next, the bad guy forces the engineer to slam on the brakes; Let’s slide the wheels to a dramatic stop. We’ll worry about flat spots later (thump, thump, thump, thump). 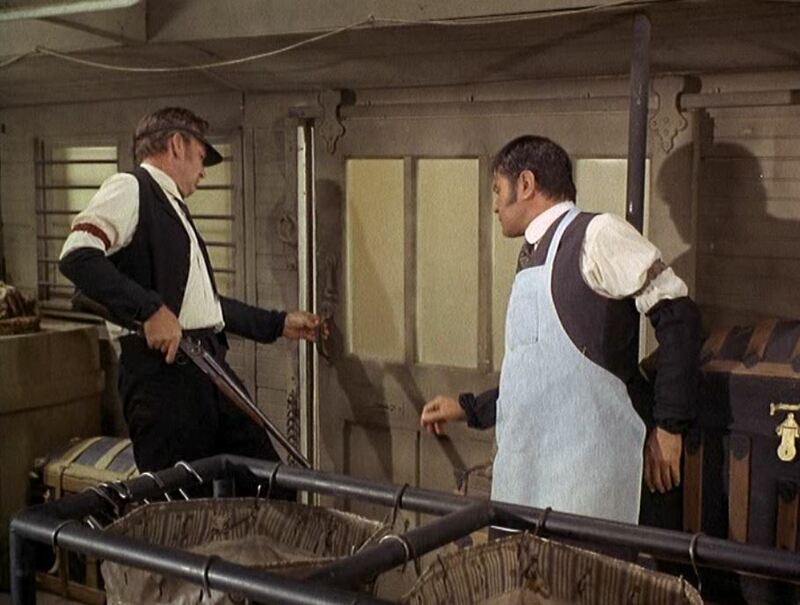 Meanwhile back in the baggage car, Tombstone (left) and Pecos (center) tie up the RPO clerk. 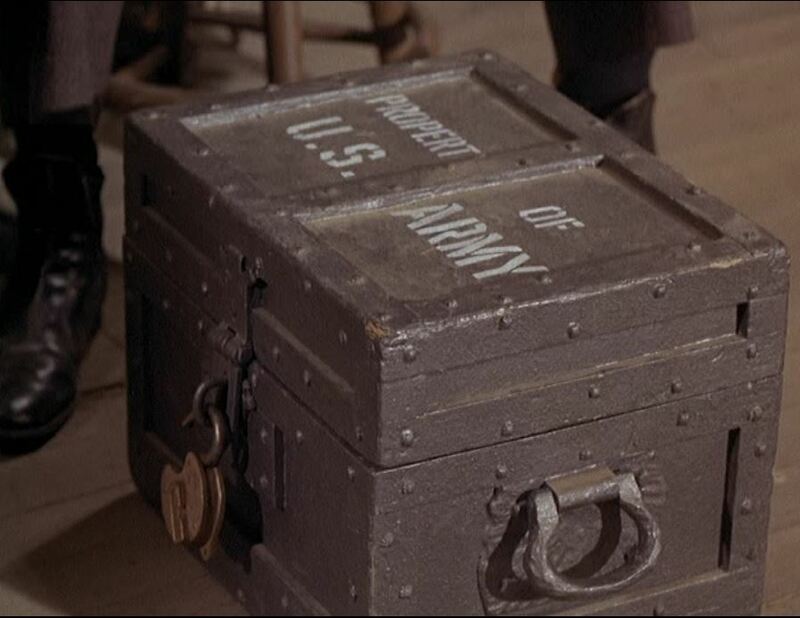 Tombstone then shoots….the lock off the strong box. 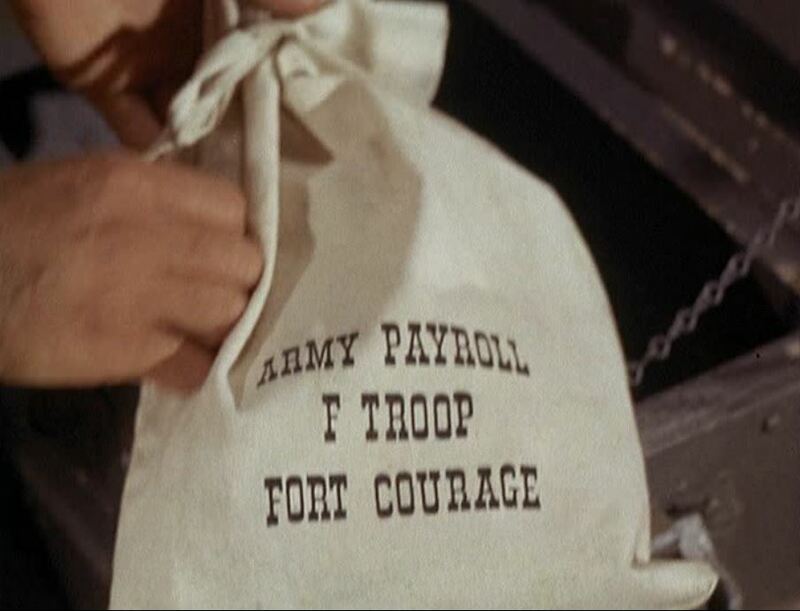 The mail thieves have made off with the Fort Courage payroll! Finally the opening credits roll. MUCH plot left off here. 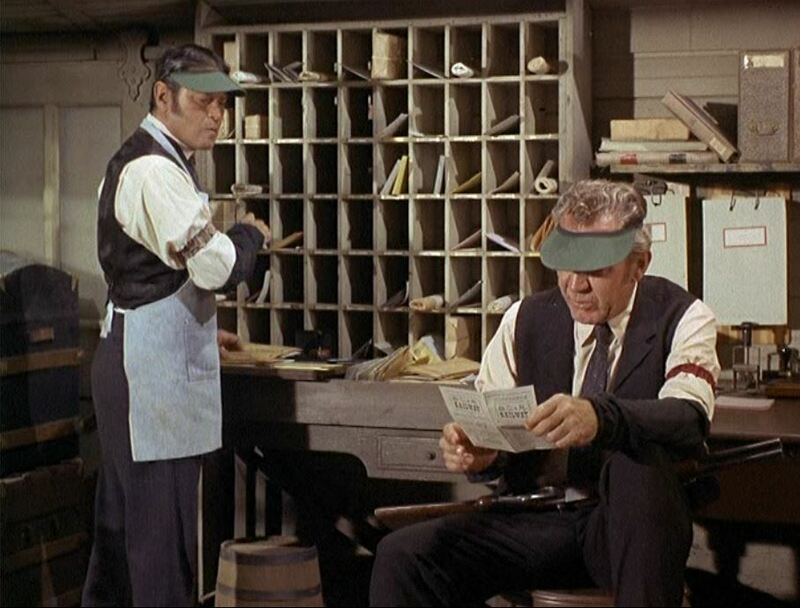 When we once again get to the “train scenes”, Agarn and O’Rourke are decked out in RPO garb, complete with green visors (to catch the mail robbers in the act — and collect the reward money). 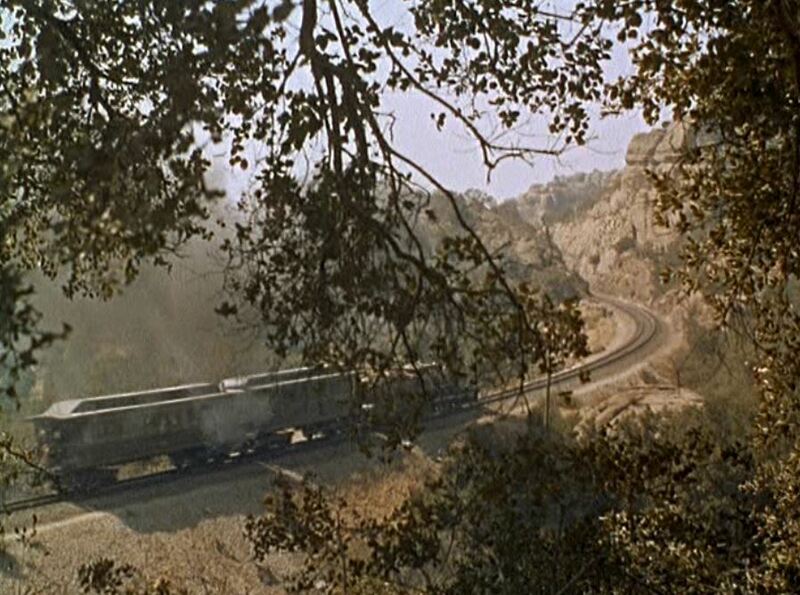 Most of the RPO scenes are, of course, on a movie set…but very well decorated with railroad paraphernalia. 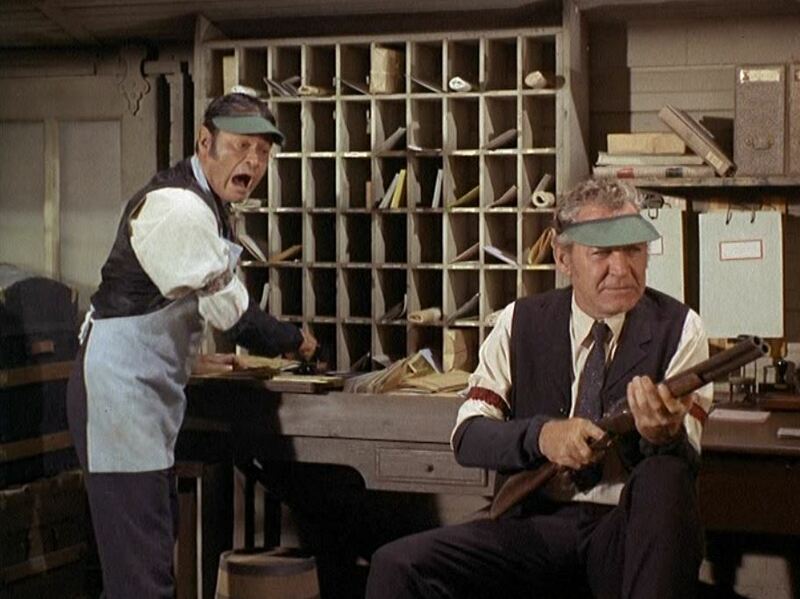 As Agarn sorts letters, O’Rourke is reading a timetable for the “B. 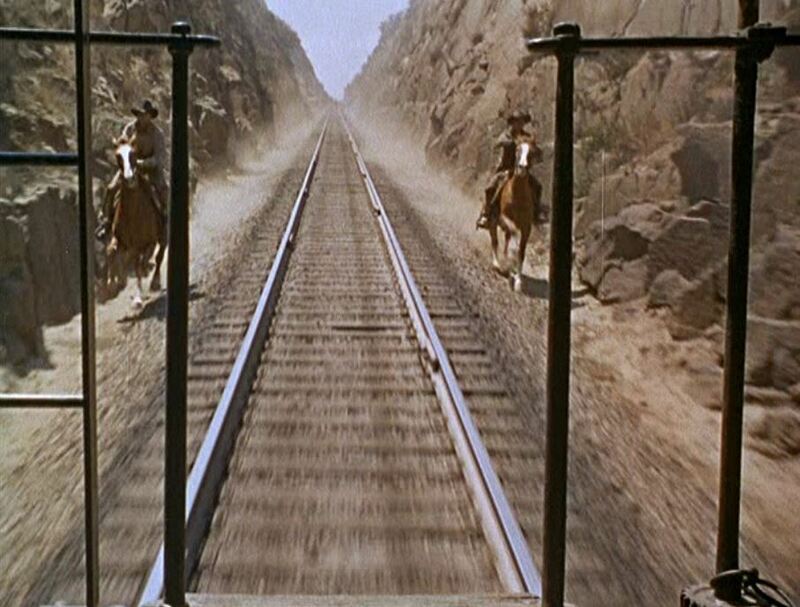 C. & R. Railway.”; Agarn reacts as O’Rourke says they’ll guard the mail with their lives. 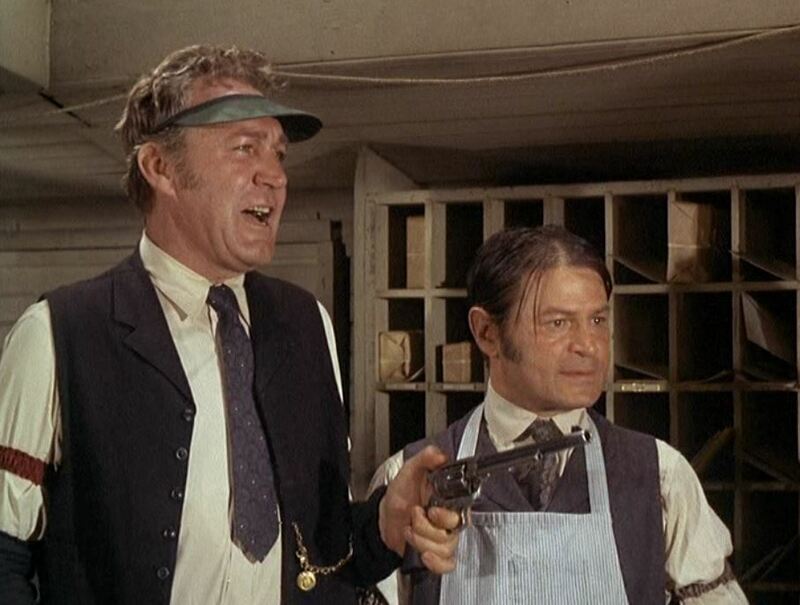 That’s quite a nifty sawed-off, side by side, shotgun in O’Rourke’s hands. 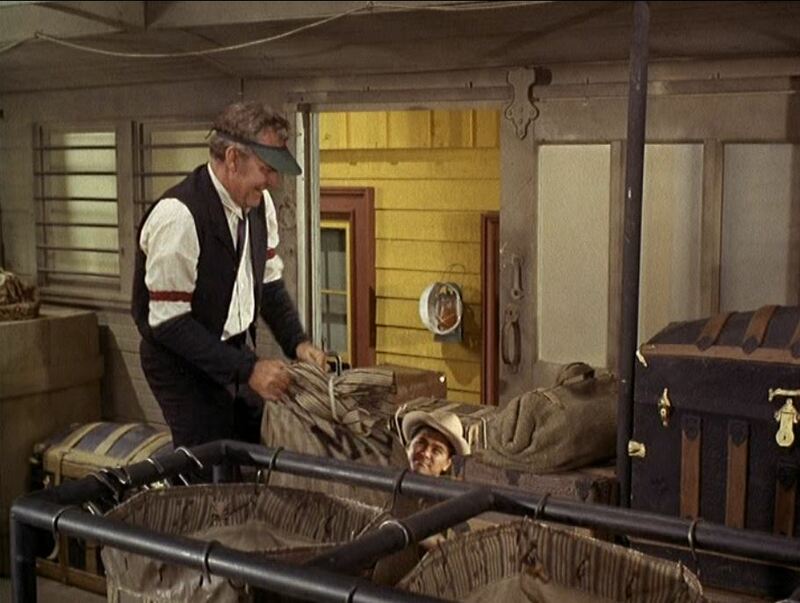 At “Lakeside” the train stops to load a couple mail sacks. One of the mail sacks is moving! 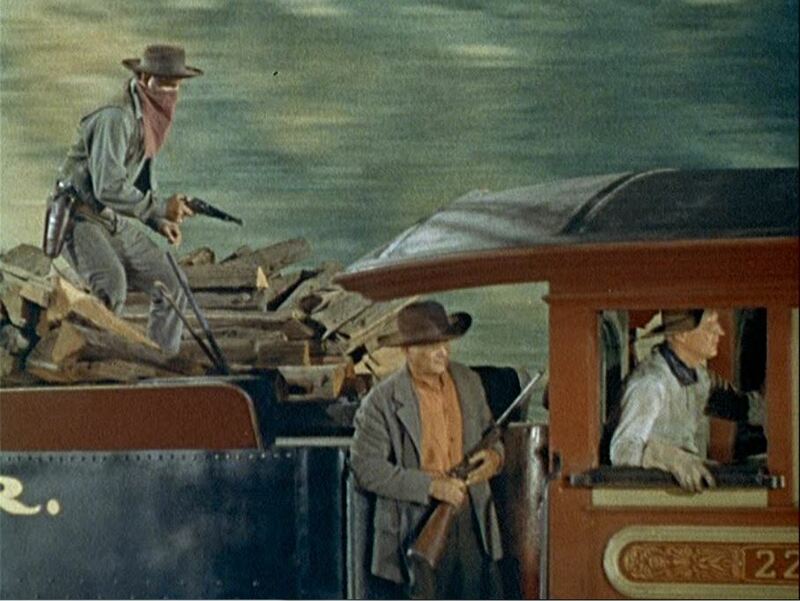 ; Captain Parmenter has stowed away to be with his men and help them catch the train robbers. 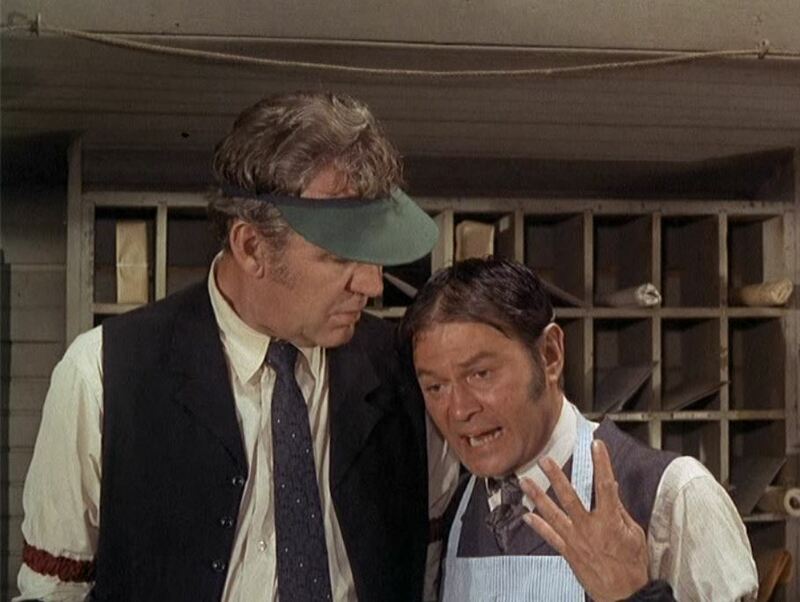 Agarn gets the bad news from Parmenter that the thieves are killers wanted in four States! 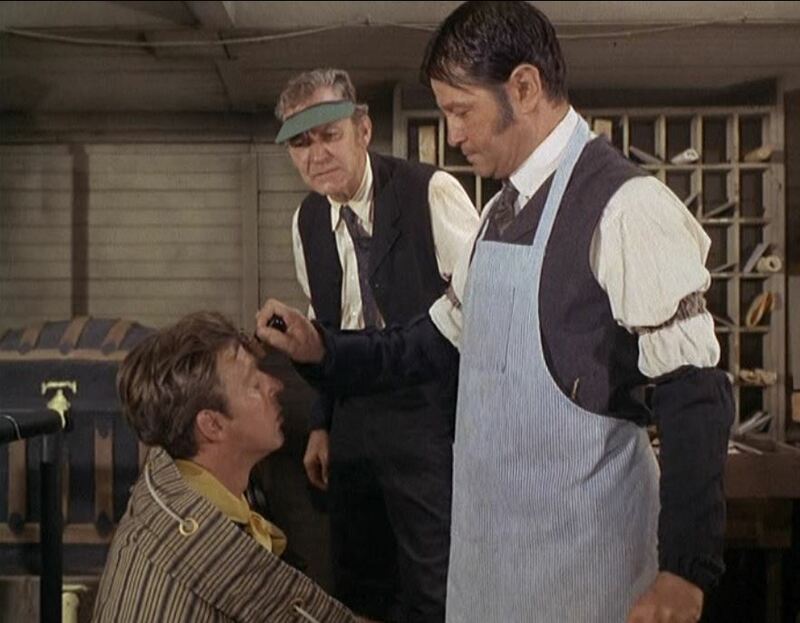 ; Before putting Parmenter back in the mail sack, Agarn stamps the Captains forehead, “to comply with postal regulations”. 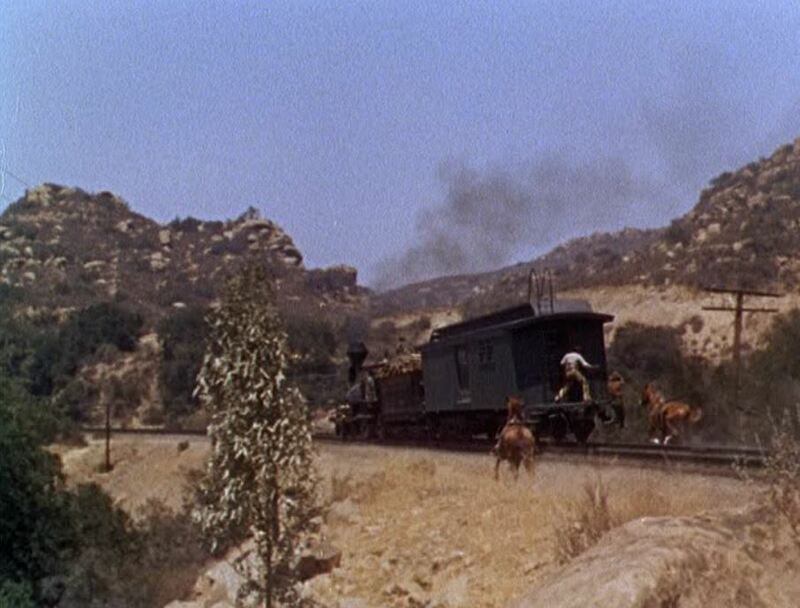 In a long and deep rock cut, Tombstone and Pecos are in pursuit of the mail train; The outlaws board the rear platform from their horses. 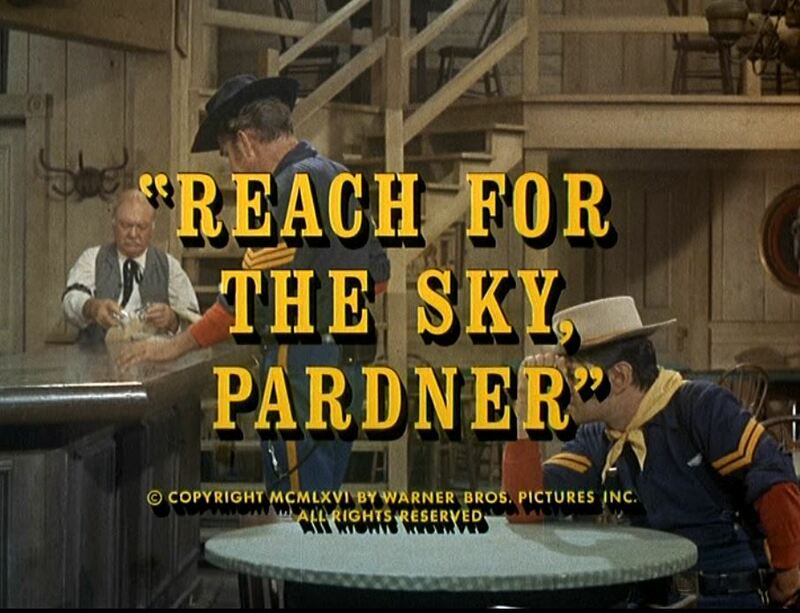 Reach for the sky, pardner! 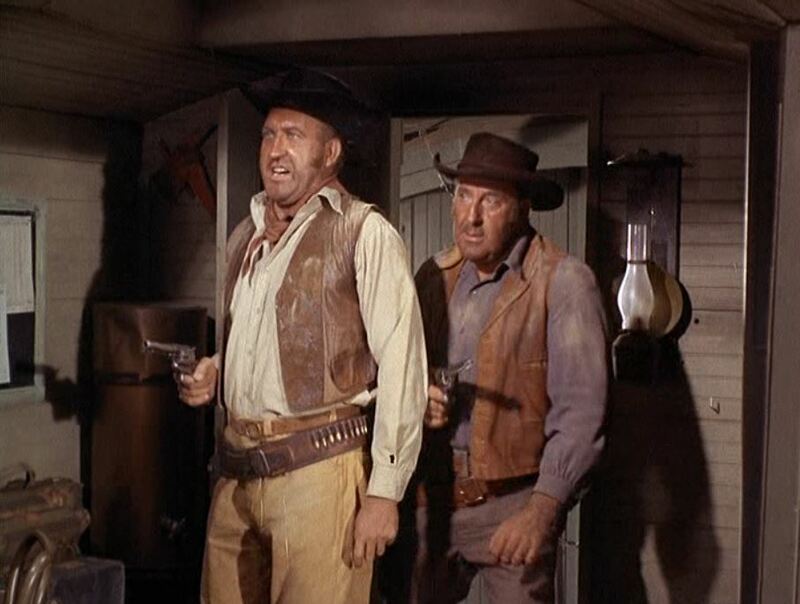 ; Tombstone and Pecos get the drop on our heroes. 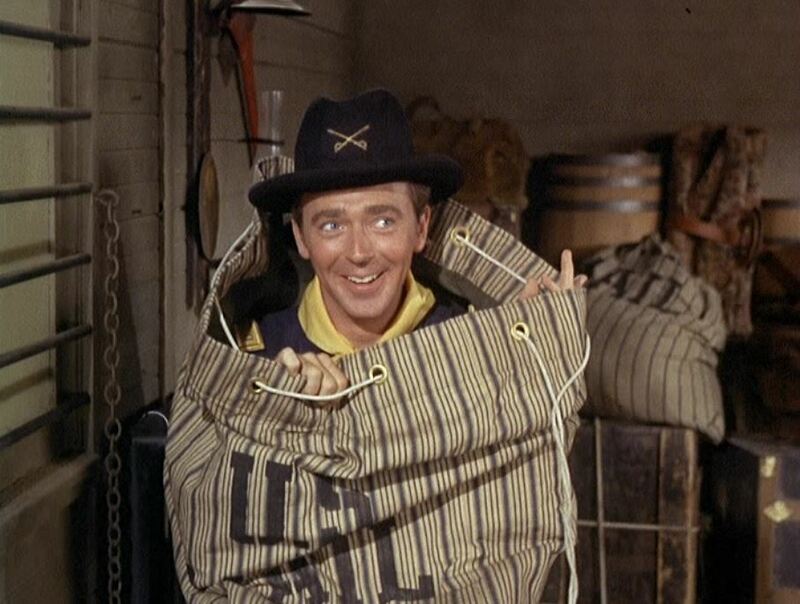 To stall for time, O’Rourke suggest there is money in the mail sacks so they all begin to open the letters. Eventually, Agarn comes across someone’s love letter and reads it out loud. 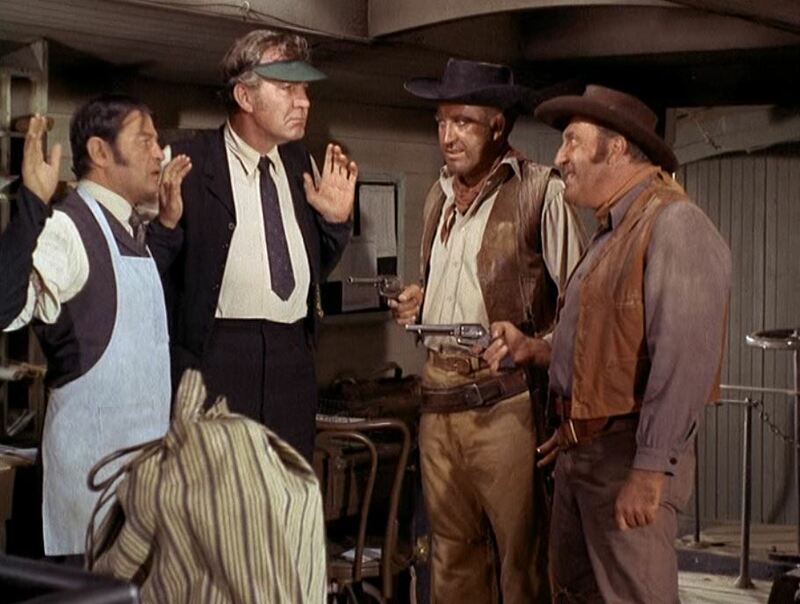 The men get so interested in the progressively steamy missive, they forget they’re in the middle of a holdup. Agarn’s saucy narration soon has all the boys enjoying this little interlude. I always heard you Latins had hot blood, but never really believed it until last night when you let me drive you home in my buckboard, sitting so close to me under that full moon. My heart was pounding and then when you put your lips up to my mouth…. (turns page for a pregnant pause)….organ and played, “La Cucaracha”, I was in heaven. But Juanita, when I kissed you good night, my lips were numb. I guess I should have told you to take the rose out of your teeth. 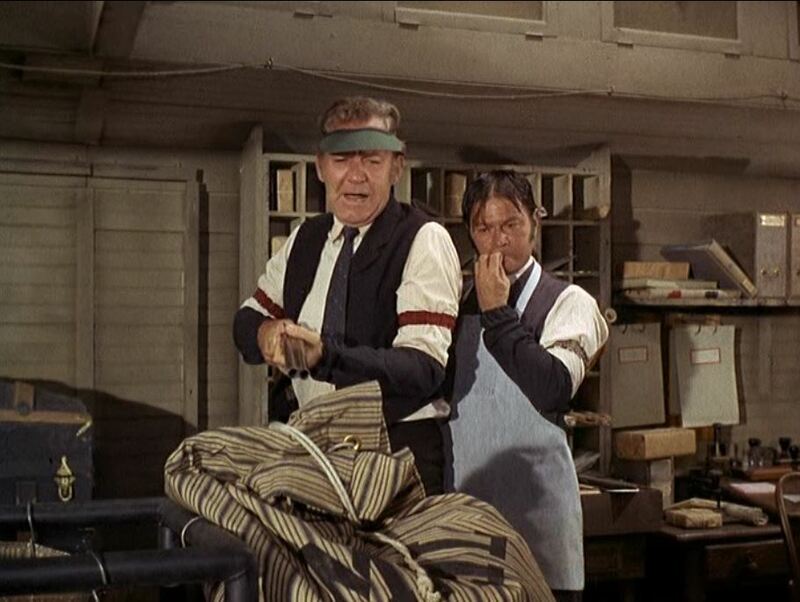 With all the distraction, O’Rourke grabs Parmenter’s gun out of the sack and gets the drop on the bad guys! 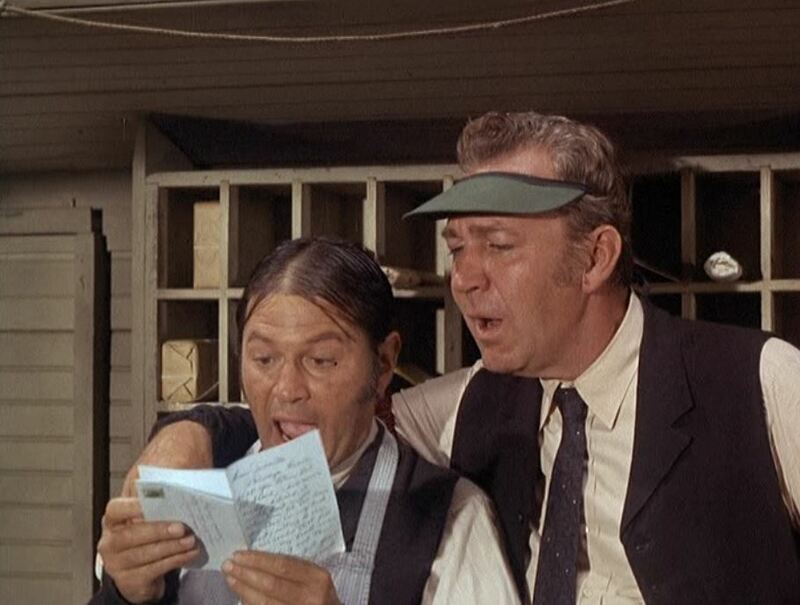 ; Soon Parmenter (forehead postage stamp still intact) is in on the action as Agarn continues to read the love letter. The scene fades to a close with the now arm-in-arm comrades sharing this special moment as the steam engine gives a big, WHOOP! WHOOP! on its whistle. Back at Fort Courage, there’s one final gag as Wrangler Jane (Rawr…RAWR!!) 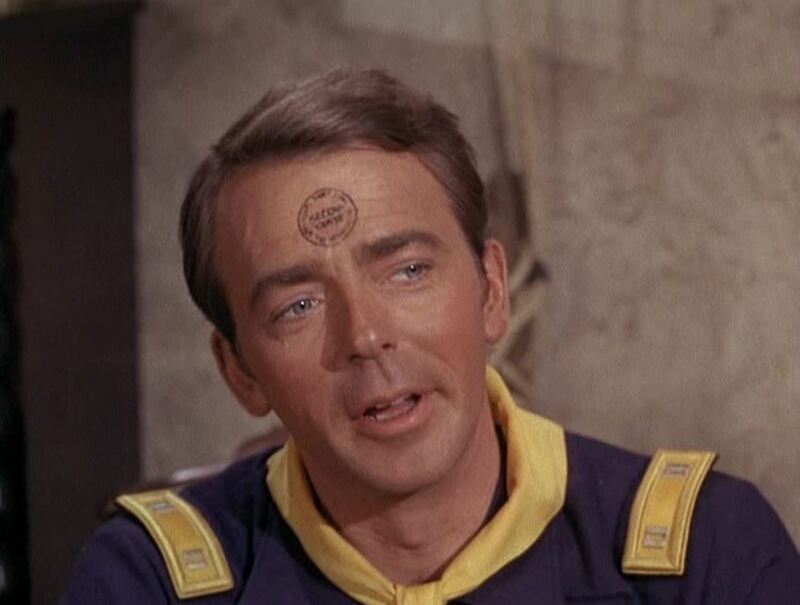 tries to get the RPO postage stamp off of Parmenter’s forehead (it is neatly transferred from person to person). Final frame is a distant shot of the little steam train. 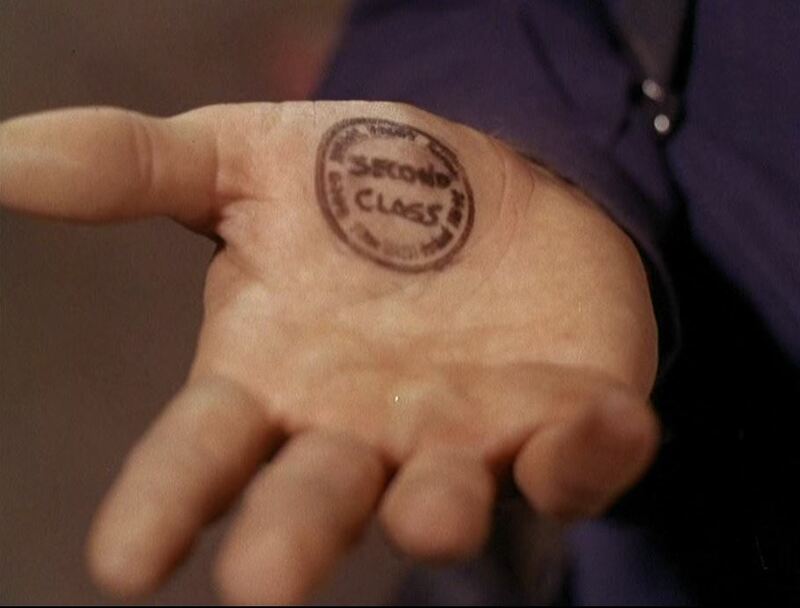 That’s the nice thing about having your own blog — you can indulge yourself with a train-laced TV episode that is not a movie, strictly speaking. I had fun writing up this little bit of fluff and I hope y’all enjoyed it too. 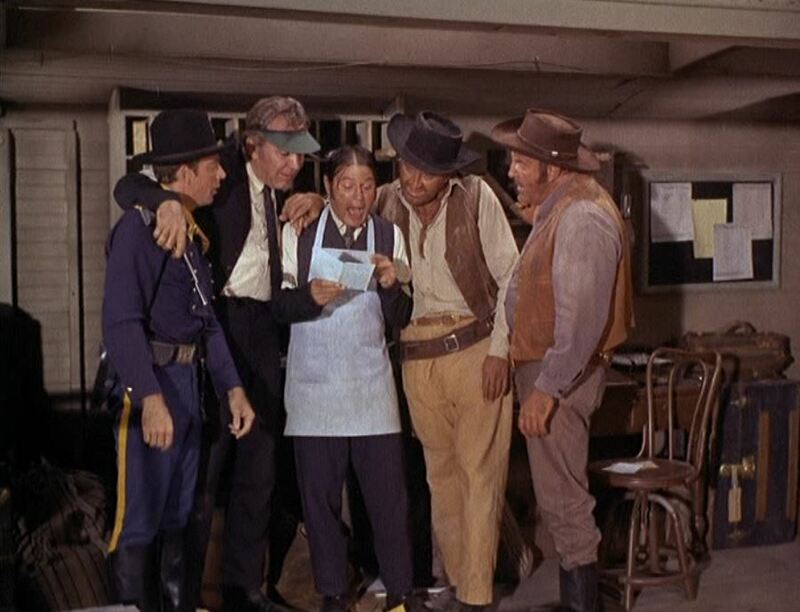 F-Troop all present and accounted for, SIR!!! 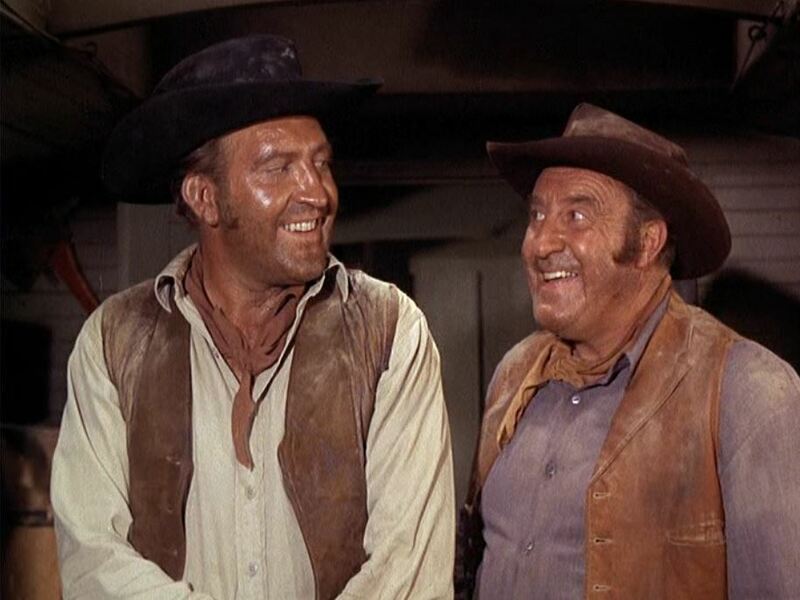 This entry was posted in Uncategorized and tagged Carson City, F-Troop, Forrest Tucker, Ken Berry, Larry Storch, Melody Patterson, Railroad Post Office, RPO car, Steam Locomotive, Virginia & Truckee, Warner Brothers. Bookmark the permalink.